A twist on a classic favorite, Red Rubin's soft green rosettes are boldly accented with rich burgundy-red at the tips for a new coloration in Hens & Chicks. 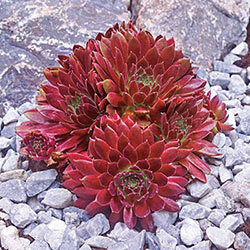 This lively sempervivum provides loads of vibrant color and architectural interest to rock gardens, pots and naturalized areas with ease. 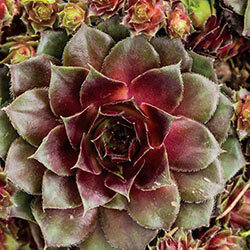 A low grower at only 4-6" tall, Red Rubin Hens & Chicks makes the perfect choice for a fast-growing ground cover near walkways and along sunny borders, too. With easy-to-grow rosettes that are drought tolerant and totally maintenance free, it is an ideal specimen plant for the landscape or even in a sunny spot indoors! Flower Form: Light pink short spikes flowers. Planting Instructions: Set plant at same level it is growing at in the container. Firm soil and water thoroughly. Full sun is best for quicker flowering and higher quality plants. Soil Requirements: Water plants thoroughly after planting or transplanting, then allow soil to dry slightly between each watering. Well drained soil. Water when soil is mostly dry. Pruning: Plants can be divided easily by pulling "chicks" and replanting them. Winter Care: No additional winter care is needed if planted in the ground. If planted in containers, move indoors or to a cool garage. 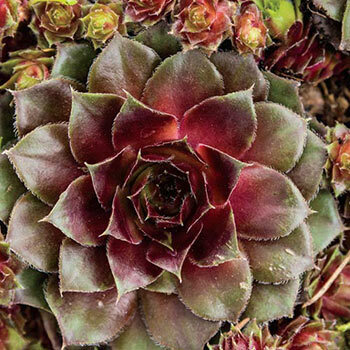 Additional Information: Sempervivum which is one large rosette "hen" sprouts smaller rosettes callled "chicks" As the plant age the "hen" will die out and be replaced with "chicks"